The arts that flourished in the independent kingdoms of the Deccan derived their inspiration not only from the Mughal empire- North India, Persia, and West Asia- but from local traditions as well. Among such objects that display originality in both design and technique is bidri ware, whose earliest craftsmen were probably Persians patronized by the ruler of the Deccan in the fifteenth century. As the descendants of the original Persian artisans became Indian, local Muslims and some Hindus joined the bidri industry. 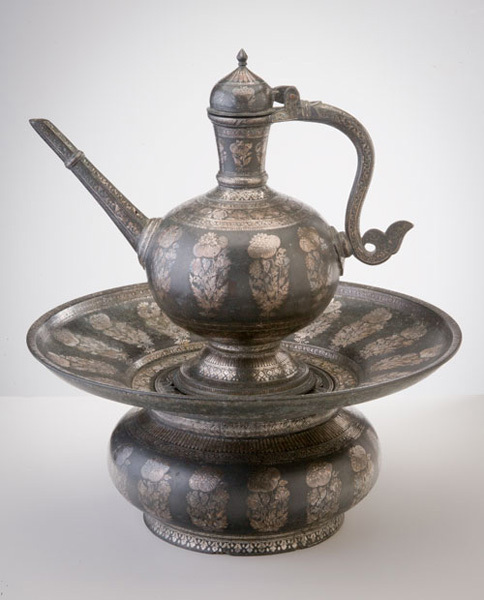 Composed of a uniquely Indian metal alloy inlaid with silver and then coated to create a permanent black surface, bidri ware was made in a great variety of shapes and sizes, including trays, cups, huqqa (water-pipe) bases, ewers, and wash basins. The superb craftsmanship and luxuriant floral designs of this ewer and basin suggest that they were made for someone of high station. Their shape, material, and decoration transform humble utilitarian objects into outstanding examples of courtly taste.